The Employees Provident Fund Organisation has initiated a facility, which allows a subscriber to download the EPF passbook using his Universal Account Number. This facility allows EPF subscribers to download and save their passbook and review the entries made over a period of time. UAN e-passbook can easily get all the details of your EPF balance. To check the UAN e-passbook, make sure your UAN has been activated. Passbook will be available after 6 hours of registration at the Unified Member Portal and changes will be effective at the same post 6 hours. Step 1: Go to the Unified Member Portal. Step 2: On this page, enter your UAN , Password and Captcha Code. Click on the third option- ‘Login’. Step 3: All related PF accounts will appear on the screen. Select which passbook you have seen. 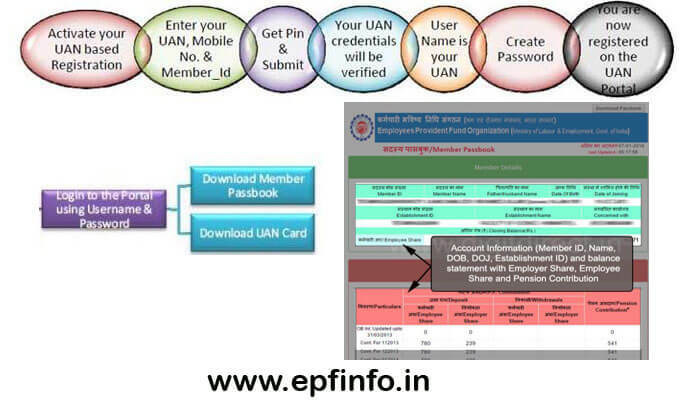 If you want to know the UAN e-passbook of the EPF through UMANG App, make sure that your UAN has been activated. UAN e-passbook can also be checked by downloading “UMANG app” from Google Play Store. Step 1: Once the app is downloaded, you need to click on ‘EPFO SERVICE’ and then on ‘Employee Centric Services’. Step 4: then system will verify the mobile number, you can view your updated UAN e-passbook details. Passbook will be available after 6 hours of registration at the Unified Member Portal and changes will be effective at the same post 6 hours.